OMD UK is planning to create a photographic archive of everyday Britain using Twitter suggestions, as part of its Future of Britain research project. The agency is working with Getty Images photographer Peter Dench, who will tour the country this summer taking pictures of people and locations that do not normally feature in representations of Britain. People will be asked to use Twitter to suggest locations or ask to be photographed as part of the project, which is supported by a digital poster advertising campaign on Clear Channel sites from today. The images will be collected online at Futureofbritain.com/gallery and are expected to appear in an exhibition later this year. The digital poster campaign will run across the Clear Channel LD6 network, a digital street furniture network in London throughout August. The ads say: "Take part in our portrait of Britain. Tweet Pete to come and take photos in your area @peterdench". 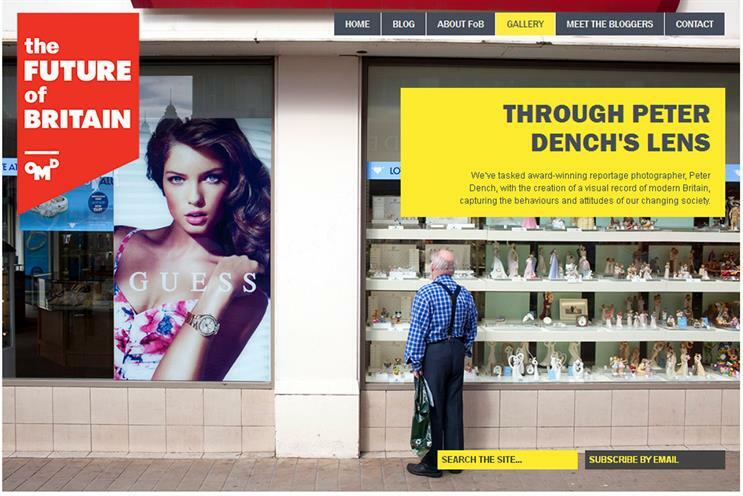 Dench is a photographer for Reportage by Getty Images. He won a World Press Photo Award in the People in the News category in 2002. The partnership forms part of OMD UK’s Future of Britain research programme, which is exploring the future of consumer society in the wake of the long-term economic downturn and changes in population. Chris Worrell, the insight director at OMD UK, said: "We live in an age when continuous change on a massive scale has become normal. "The Future of Britain aims to provide a guide to a new consumer landscape; the association with Reportage by Getty Images will enable us to bring to life some of the fascinating truths unveiled by the study and provide an historic archive for the future."